Britney Spears got her first break as a member of the mickey mouse club, then flash forward 10 years and she became the most popular pop princess of all time. Britney Spears clearly possesses stunning natural beauty, but that doesn't mean she wouldn't go the extra mile and make a slight adjustment to an already lovely nose. 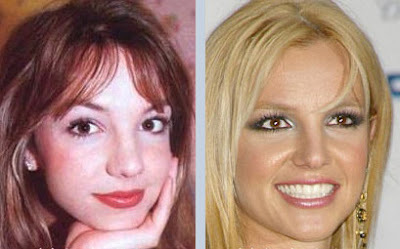 As you can see in these before and after pictures listed below, it seems at some point Britney Spears decided to get a nose job (Rhinoplasty) to narrow the width a tad. Some might say this was uncalled for, while other would say "you go girl". You make the call! She never had a nosejob! It's just the makeup! are u blind?? of course she has had a nose job! I think the speculation of plastic surgery came to a forefront of culture starting with Michael Jackson and then Britney after her supposed breast implants at 17. I've been a Britney Spears fan since 1999. I didn't want to believe that it was true, and although I think she got them at 17, at some point it seems like she had them removed. I also speculated heavily on if she had a nose job. Britney Spears has not had a nose job. The width and breadth of your smile, makeup, the angle of the picture, and weight loss can affect the shape of your nose.